1. Preheat the oven to 220°C, gas mark 7. Place a roasting tin in the oven to heat. 2. Meanwhile, cut the root veg into 1cm pieces and place in a bowl with the groundnut oil and 2 tbsp fish sauce. Toss thoroughly, then tip into the preheated roasting tin. Roast for 30 minutes, stirring after 20 minutes. Reserve the bowl. 3. Into the reserved bowl, add the orange zest and juice, garlic and remaining fish sauce, sesame oil and seeds. Season, then toss the salad leaves in the dressing. 4. 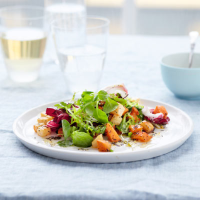 Serve the roast vegetables on a bed of the dressed salad leaves, with any remaining dressing spooned over. Garnish with a few coriander leaves.